One of the rarest weapon skins we've added yet. Harness a slither of the power of Karon. 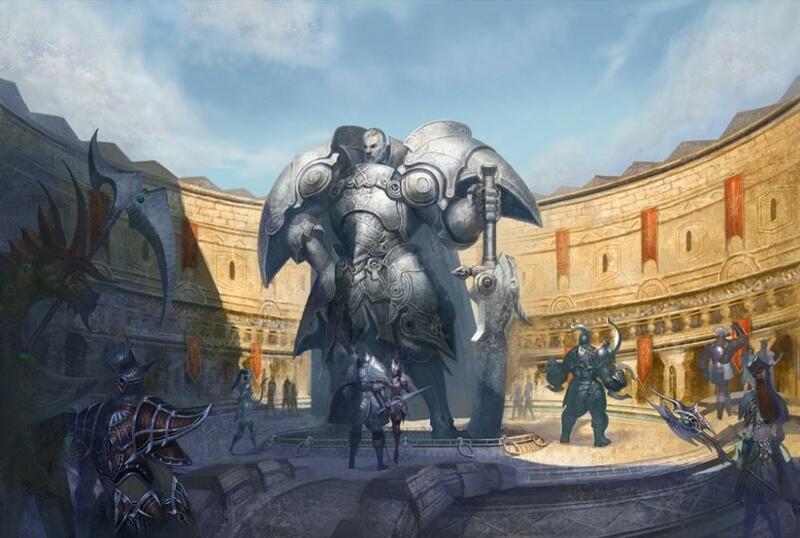 Compete against other top players in Colosseum for exclusive rewards. Breathtakingly beautiful, but extremely dangerous. This upcoming season (Feb. 1~Feb. 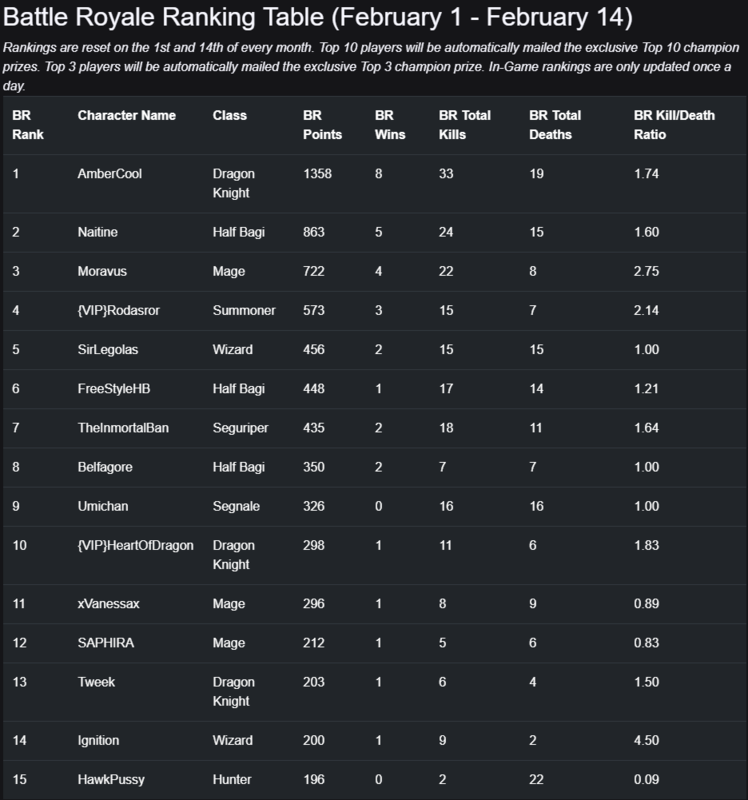 14) of Battle Royale will be met with bonus rewards for the top 15 ranking players! At the end of the ranking season, bonus prizes will be mailed to the top 15 scoring players in Battle Royale. Any changes to this event will be made here in this article! Prizes will be sent within 24 hours. All prizes have been sent. The Rising Staff Team is constantly working on projects to make it easier for new players to learn Dekaron Rising, and thats why we made you this super awesome FAQ thread. This will be updated everytime a new patch is released. Q. I am a new player here! How do I get started? Q. Where is the best place to farm Dils? A. One of the best ways to farm dils is by killing Shadow Kris in Under Crespo Main. To get there teleport from Makaio in Ardeca to Parca Temple and then from Parca Temple to Under Crespo Main. Shadowkris drops 5mil dils and commonly drops Copper Argates and Silver Argates while also having a slim chance of dropping a Gold Argate. Q. What are the succes rates of Options? Q. Where do I find Gold Argates? A. Gold Argates are rare drops from monsters in The Deadlands, Space of Pilgrimage and Under Crespo Main. Gold Argates are mostly farmed by killing the Nymphs in Draco Desert. There are 2 Nymphs in Draco Desert and each drops 6 gold argates. Gold Argates also drops from all bosses in Tower of Spell dungeon (higher floor = better drop). Tower of Spell is the recommended place for new players to farm Gold Argates. Q. Where do I find Copper and Silver Argates? A. Copper and Silver Argates are incredibly common. People sell them for less than 3mil for a full stack. They are very common drops from Shadowkris (Parca Temple). Q. How do I get 151 wings? A. To get the level 151 wings you have to go to The Deadlands and farm 300 Mithrils. Mithrils are common drops from any monster in The Deadlands. When you have 300 Mithrils go to NPC Ishtar in Ardeca and exchange them for level 151 wings. Q. How do I get dshop wings? A. To get Dshop wings (or any other dshop items) farm dils and buy them from other players. When doing dshop or donation transactions, always remember to call a Dekaron Rising Staff member to help ensure a safe transaction and avoid anyone from getting scammed. You can also simply donate for coins and buy them directly from the Dshop store. Q. What is the best class for farming? A. The most commonly used class for farming is the segureaper. The reason for this is it's high DPS and ability to heal itself. Segureaper is a great all-around class. Q. What are Dragon Bones and where can I get them? A. Dragon Bones are uncommon drops from Cuff Juliegh and Juliegh monsters in Draviss Fields. You can either sell them to other players or exchange them at NPC Stacy in Ardeca for Blacksmith and Alchemist Protectors. Q. What are Draviss Artifacts and where can I get them? A. Draviss Artifacts are uncommon drops from Cuff Juliegh and Juliegh monsters in Draviss Fields aswell. There are 2 types of Draviss Artifacts. Dravis Normal Artifact & Dravice Authentic Artifact. You can exchange these at NPC Stacy in Ardeca for a variety of Dshop buffs. Alternatively you can also sell the artifacts to other players for dils. Q. How do I get Daes Arie ring and how do I upgrade it? A. To get Daes Arie ring go to Egutt Desert level 100 area and farm 300 beads of deal. Then exchange those into the Ring of Jebaheu at NPC Ishtar in Ardeca. Then farm 1500 Narukes in Egutt Desert level 181 or 160 area and exchange your Ring of Jebaheu and 1500 Narukes into the Daes Arie ring. To upgrade your Daes Arie ring into a Tiesto Arie ring, a Dark Stone and a Mana Crystalline is required. Dark Stones and Mana Crystallines drops from Tower of Spell bosses. When you have a Dark Stone and a Mana Crystalline go to NPC Luster and NPC Kaylor in Rest of Admirers to upgrade the ring. Q. How do I get Seal of Destruction and how do I upgrade it? A. Seal of Destruction is a very common drop from Neo Deux Marble boss in Tower of Spell Dungeon. To upgrade Seal of Destruction into a Signet of Chaos you need a Dark Stone and a Mana Crystalline like with the Daes Arie ring. It is worth mentioning that the Signet of Chaos ring is very common and people often sell them for only 200mil. Q. How do I get Noble Soul and how do I upgrade it? A. Noble Soul drops from the Lionheart boss in Egutt level 160+ Area. This boss is very strong and I recommend you get someone to help you kill it. Unlike Daes Arie and Seal of Destruction, you can equip up to 4 Noble Souls at once. You upgrade the Noble Soul the same way you upgrade your Daes Arie and Seal of Destruction. Q. I'm new here what class should I make? A. You should make the class you think is coolest! Q. Where do I find crap gems for socketing equipment? A. Crap gems are common drops from the monsters located down in the left cornor of the Aquarai Map. To get to Aquarai, teleport from NPC Makaio in Ardeca. Q. How do I get Squama and Lach? A. Squama and Lach are obtained from NPC Lowe in Ardeca. Squama and Lach costs Purchase Points which are obtained in DKSQ. DKSQ is a PVP Instance where 2 teams face eachother in a 30 minute battle. Squama costs 900k Purchase Points. Lach costs 1.5mil Purchase Points. Q. How do I upgrade my Squama and Lach? Q. Where do I find level 170 Necklaces? A. Level 170 Necklaces are average drops in Mitera as +7. Q. Where do I find 180 Necklaces? Q. How do I get Teragrace Accessories? Q. How do I get emblems? Q. Where do I find Speedboots V3? A. Speedboots V3 drops from Mellias boss in Underground Temple. To get to Underground Temple, teleport to Mitera from NPC Jerome in Ardeca and head to the portal and the top left of Mitera. Mellias is extremely strong and you will need party to kill him. Q. Where do I find level 180 Weapons? A. Level 180 weapons are rare +7 drops from all monsters in Mitera. Q. Where do I find level 195 Weapons? A. Level 195 weapons drops from the Gold Dragon boss in Arcadia, Kamat monsters in Arcadia and from Dikesel boss in Cherubim Nest dungeon. Q. Where do I find level 200 Weapons? A. You can buy level 200 weapons from NPC Lowe in Ardeca. They cost 2mil Purchase Points. Purchase Points can be obtained by participating in DKSQ. Alternatively you can buy them for 12.5k coins in the Dshop. Q. Where do I find +90 resistance gems? Q. Is there somewhere I can see the DKSQ ranks? Q. What is Siege and how does it work? Q. What are Blood Bottles and how do I get them? A. Blood Bottles are exchangeable misc items dropped by all blood enemies in Parca Temple. Blood Bottles can be used to exchange at NPC Binaelle Fairie in Parca Temple for various goods or sold to stronger players for dils. Q. What are Dream Powders and how do I get them? A. Dream Powders are exchangeable misc items dropped by all enemies in Python Castle, Doomed Maze, The Deadlands and Mitera. Dream Powders can be used to exchange at NPC Karin in Ardeca for various items or sold to stronger players for dils. Q. What are Skins and how do I get them? [Skin Diamond] Maelstrom [Skin Diamond] Red Light [Skin Diamond] Purple Crystalline [Skin Diamond] Cursed [Skin Diamond] Tech Skin Diamonds are obtained through our unique endgame PvE content that offers extremely hard but fun bossfights. For more info about how to change the skin of a +10 level 200 weapon check NPC: [GM]Katarina next to West Mailbox in Ardeca. 3. Once you are level 60+ return to Ardeca. Alright you have made it this far and the easiest part is over and you are now level 60 and have bought your skills and potions. 8. Go to the NPC "Commander" and teleport to the level 60+ area. Keep slaying the monsters in this map until you think you are strong enough to take on the monsters in Egutt Desert once again. 9. Once you have leveled from level 60-80 click your return scroll you bought earlier and return to Ardeca. 10. Once you have returned to Ardeca re-enter Egutt Desert and teleport to the level 80 area this time. Keep leveling at the level 80 area until you reach level 102 then use another return scroll and return to Ardeca. 11. Once again re-enter Egutt desert and this time level from 102-120. At level 120 return to Ardeca again. 12. Re-enter Egutt Desert again and enter level 120 area. Level from level 120-140 then return to Ardeca again. 13. Re-enter Egutt Desert again and enter level 140 area. Level from level 140-160 then return to Ardeca again. 14. Re-enter Egutt Desert again and enter level 160 area. Level from level 160-181. Here you also farm your new set. +9 Level 170+ set, weapon and accessories. Monsters have high drop rate. You have now completed my new player guide! You should now be level 176-180 and fully equipped with your new +9 170 set, wep and accessories. You are now ready for the next step. This is also where the new player video tutorial ends and if you watched that then what comes next is the more specific details I promised you in the end of the video. Or you can go to deadfront from 166-180. Deadfront is the best EXP from level 166 to 180 so keep an eye out for Deadfront announcements in game or check the timer on our forum front page. Once level 180 the best place to level is in Tower of Spell dungeon. When you are level 190 the best place to level is Parca Temple. To get to Parca Temple speak with NPC: Makaio in Ardeca. Parca Temple is level 190+. Open your inventory and use your Miteria scroll (or go to NPC "Jerome" coordinates 350 : 142) Monsters in Miteria drops the next gear sets but only +7. You can farm these and upgrade them later on. The gears are called Osmium and is the 2nd strongest gear in game. Osmium can be upgraded all the way to +10. You will also find level 180 +7 weapons here and level 170 necklaces, rings etc. Once you have +10 osmium and 180 wep you can start competing with other players. Tower of Spell dungeon - Tower of Spell has been reworked and is now the best place to level from 180-190. Besides that, Tower of Spell is now also the best place for new players to farm gold argates so they can upgrade the gear they farm in Mitera. Ruins of Rudene - Ruins of Rudene has been reworked and offers good EXP at level 190+. The dungeon is designed for mid gear players (+9 osm and up) with the exception of the last boss Rudene who is designed for end game players. The Deadlands - In The Deadlands you will be looking for "Mithrils". Mithrils are common drops from all enemies in The Deadlands and are used to exchange at NPC Ishtar in Ardeca for level 151 wings. The monsters here also drops dream powders, marvics and argates. Crespo Abyss - In Crespo Abyss / Under Crespo 1 you can farm Grade Points which gives your character higher rank. When you rank up you are rewarded with extra statpoints. You get 3 stat points each rank. (IMPORTANT: The higher rank you are the harder it is to farm Purchase Points in DKSQ later). Parca Temple - In parca Temple you can find Shadowkris near the waterpools. Shadowkris drops 5m dils and a random argate. Another type of enemies that spawn in Parca Temple are Sap enemies. The easiest Sap enemy to deal with are the Sap Testee 1. The Sap Testee 1 are more common in the right wing in Parca Temple. Sap enemies drop Sap Bottles which you can exchange for various items at NPC Binaelle Fairie who is located next to the teleporter NPC Conrad. Parca Temple is the BEST place to level at 190+ but also the hardest place. Abandoned City - In Abandoned City you will be farming for wing fragments to upgrade your level 151 wings. Fully upgraded level 151 wings have the same stats as Dshop wings. The exchange NPC is located at the Abandoned City entrance. To get to the Abanandoned City speak with NPC Orz in Ardeca. Aquarai Ruins - In Aquarai Ruins you can find the so called "crap gems" which are gems so bad that they serve no other purpose than to increase the success chance of you creating a socket in your armor or helmet. 1 gem = 5% more chance of succes. You can sacrifice up to 5 crap gems which is a total of +25% increased chance to make a socket. If you have any questions about anything you feel I forgot or didn't specify in the guide feel free to join our Discord and shoot me a PM there! Please check out the links below. They will help you even more I guarantee you!